Since the establishment of the Jewish state in 1948, Israel has spent 30 years at war with giant neighbour Egypt and another 25 years in what both sides admit is a "Cold Peace". The wars and subsequent peace have always been determined by the Palestinian situation. 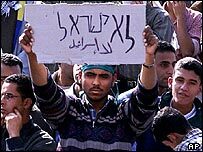 So since the outbreak of the Palestinian intifada (uprising) in September 2000, relations have become positively icy. Cairo backed away abruptly - withdrawing its ambassador from Tel Aviv and spearheading Arab opposition to Israel's policies in the occupied territories. Israel has meanwhile been highly critical of what it sees as Cairo's allowing a vicious anti-Israeli attitude to prevail through vilification in the media. What Egypt has never done is repudiate the 1979 Egypt-Israel peace treaty which was meant to define relations between the two countries. These included the de-militarisation of the Sinai peninsula, normal diplomatic, economic and cultural relations, the free movement of goods and people and mutual protection under the law. The treaty is also the basis of Egypt's strong ties with the United States and the billions of dollars of American aid it has received since it was signed. 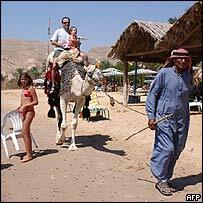 The cold peace means that few Egyptians are ever to be found in Israel, and the current security situation means most Israeli tourism is restricted to resorts in the Sinai peninsula. Tens of thousands of Israelis cross the border every year to Sinai, where they have traditionally enjoyed a warm welcome from the indigenous Bedouin population. The area is very remote from the teeming cities along the Nile where Egyptians are much more moved by the sufferings of the Palestinians. For many Israelis, Sinai offers the opportunity to gamble - which is illegal back home - but in recent years it has also became an escape from the demoralising effects of the intifada. 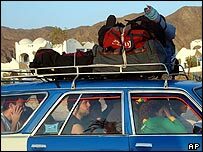 Until the Taba and Nuweiba bombings, it does not seem that Israeli tourists have ever faced more of a risk from terrorism than any other foreigners in Egypt. However, the ones caught in Thursday's attacks were there in defiance of an official Israeli warning against travel to Egypt because of a "concrete" threat of terrorist attack. The initial reaction from the Egyptian government has been to point to Israel's military operations in Gaza as a likely trigger. "I think the explosions are very related to what is going on in Gaza. We condemn these attacks which have harmed many people," government spokesman Magdy Rady told the Associated Press news agency. This kind of subtle blame-shifting is symptomatic of how poisoned the atmosphere between the two countries has become as a result of the conflict in Gaza and the West Bank. 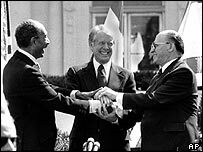 There was a great sense of optimism back in the late 1970s and early 80s, when the then Egyptian and Israeli leaders won Nobel prizes for their role in agreeing the first peace treaty between Israel and an Arab state. In November 1977, Egypt's President Anwar Sadat broke the long and bloody impasse by flying to Israel to deliver a message of peace directly to its leaders. His offer was conditional on Israel's pulling out of all the territories it occupied in the 1967 war, including Egypt's Sinai peninsula. A year later, days of talks at the US presidential retreat in Maryland resulted in the Camp David Accords, laying out Israel's commitment to withdraw from Sinai in exchange for normalising relations with Egypt. They also included a formula for a two-state solution to the Israeli-Palestinian issue, giving Palestinians autonomy in the West Bank and Gaza. The peace treaty was finally agreed and signed on 26 March 1979. For Israel it was a major breakthrough, though it meant giving up all the strategic advantage gained by seizing Sinai in 1967. For Egypt, it meant an end to a long and draining conflict, but it also brought hostility and years of being ostracised by Arab allies for allowing itself - the most potent Arab military power - to drop out of the Arab-Israeli conflict. It also sealed Mr Sadat's fate. He was assassinated by Egyptian Islamic militants during a military parade on 6 October 1981. In many ways, the future of Egyptian-Israeli relations is secure - or as secure as anything in the Middle East in its current state. Both sides have too much to lose from abandoning the status quo. But some Israeli analysts are wondering how Egypt will position itself towards Israel following the departure of its long-standing leader, Hosni Mubarak. There is also the question of how the Israeli-Palestinian conflict will develop, not to mention the US "war on terror", which has caused much anguish for Egypt and America's other allies in the region. In the short term though, much will depend on how Egypt responds to the Taba/Nuweiba attacks targeting Israeli tourists. Any more linkage to Israel's policies in Gaza is certainly not going to go down well with the Israelis. Israeli visitors are gone - no one knows when they'll be back, Penny Spiller writes.